Day 4 brings an expanded search area in the case of the missing flight MH370. This Wall Street Journal illustration shows the expanded areas. That these areas are behind the intended flight path of the missing Boeing 777 is intriguing. 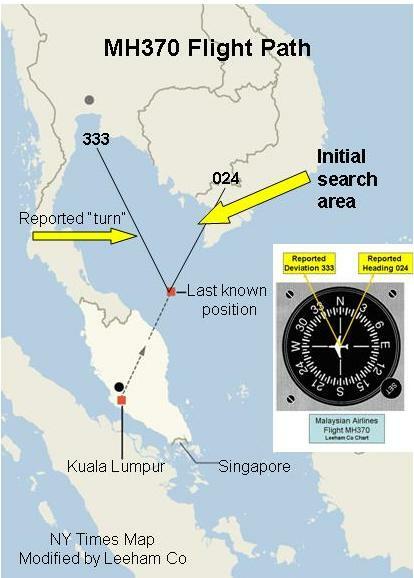 It’s previously been reported that radar returns indicated the airplane “turned back” toward Malaysia before all electronic contact ceased. In our best armchair quarterbacking, we’ve plotted 024 and 333 on this map, which originated with The New York Times and which we heavily modified. In the absence of further public information, the “turn around” seems to be misstated. The Aviation Herald cites Chinese radar. 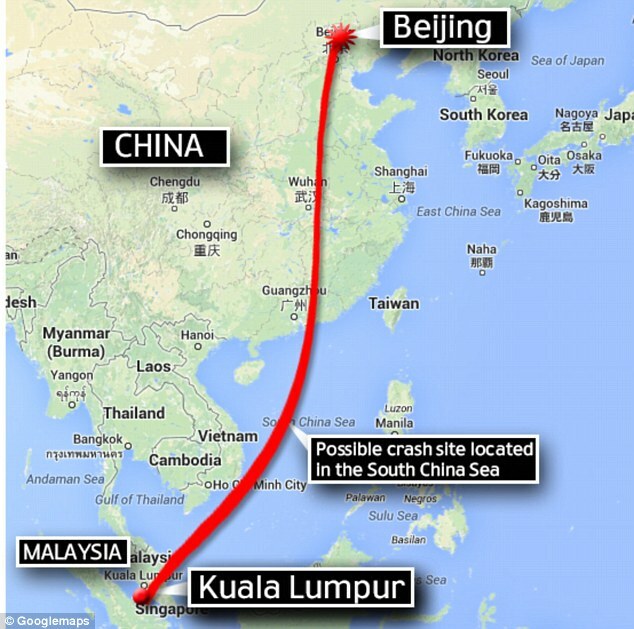 A map published in the Daily Mirror, below, shows a different flight path possibility and a new possible crash site, based on sighting some “debris,” which as we know may or may not have nothing to do with MH370. This location would make more sense for the “Chinese radar” than the previous focus of the Gulf of Thailand and would more or less be consistent with a course of 024. But it is important to note that the actual flight path, after the point of loss of contact some 40 minutes after take-off, is speculative. This map immediately above shows a flight path that is inconsistent with the last known position of MH370. The current search areas causes us to wonder if primary radar contacts were made to lead investigators to believe going southwest is where efforts should be concentrated. Flight Global recaps the causes of in-flight accidents here and it talks about the difficulty in technology for Search and Rescue missions here. Some of our Readers wonder whether hypoxia is to blame. We don’t think so. This wouldn’t explain why the transponder and ACARS stopped transmitting prior to the turn. The two “passport passengers” have been identified as Iranian, but Interpol doesn’t believe terrorist was involved. This linked article addresses a number of possibilities and also touches on the transponder and ACARS issues. With terrorism being played down, hijacking, sabotage and personnel disturbances on board are now among the possibilities. Time has this story detailing other aircraft disappearances. 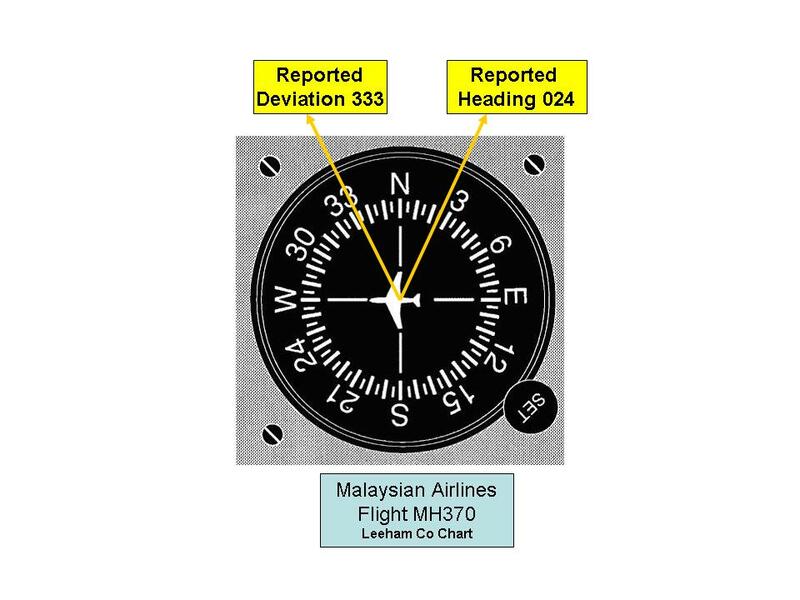 Airchive reports that the military radar may have tracked MH370 west of Malaysia, at an altitude of 29,000 ft–down from its assigned cruising altitude. If true, this lends to our belief this was a criminal act–but by whom? Hijackers or a rogue pilot? Airchive’s link to the Indian news report is a key one to click. What about a fire in the forward cargo hold, like the Value Jet-592 accident back in 1992 or Swiss Air-111 in 1998? The B-777 is a FBW airplane which is heavily depended on electrical circuits. That could explain the immediate loss of transponder replies and communications. if we assume course 333 as transient on a further turn ;-? From what we know of the flight we have traceable evidence of the incident between one and two and a half hours after take-off with the incident considered major at the two and a half hour period. I am no expert, but from my own recollection of previous accidents seems to suggest the one and a half hour window is a common pattern. The question becomes could the problems encountered by the MH370 aircraft be statistically consistent with previous aircraft incidents, but with the difference simply being the geology where the incident occurred? We have the recent AF447 and Adam Air incidents where on both occasions the accident site was the ocean. Even though the AF447 oceanography was far more challenging than the Gulf of Thailand the last known location of the aircraft was relatively well understood. Due to the size of the Adam Air aircraft (737) the range of possibilities (or locations) was far less than MH370. With exponential air travel growth in South East Asia expected over the next two decades and with a good proportion of flying to be over water are we seeing an emerging trend in types of accidents and subsequently investigations. If we throw into the equation potentially confused responsibilities between states, many with self-vested (military) interests it could be the case the nature of aircraft accident investigations could fundamentally change. Regardless of what happened to MH370 we could actually be at a cross roads in the management of civil air safety. Can the transponder be turned off by the crew and if so, why is that possible? I would think that such a feature would (should?) be hardwired in with no chance of it being deactivated when the aircraft is in flight. Most airliners have two transponders, and yes they can be turned off, or put into standby by the crew inflight. Thanks topboom. Do you know why they have this capability? It seems to me that this defeats the purpose of the device. It is just like most equipment, the radios, navigation systems, autopilots, etc. They have an on/off switch, and in the case of the transponders, another position called standby, where the equipment is on, but not transmitting. None of it makes sense! Could it have gone under the radar, and have maybe gone to some “airport” in some corrupt country that wouldn’t say a word about it to the world? Maybe re fueled, and onto somewhere else?